Finding the perfect snack can be hard, making it gluten free can be even harder. Here’s a fun round up of 20 Easy Gluten-Free Snack Ideas to help take the guess work out of snack time. 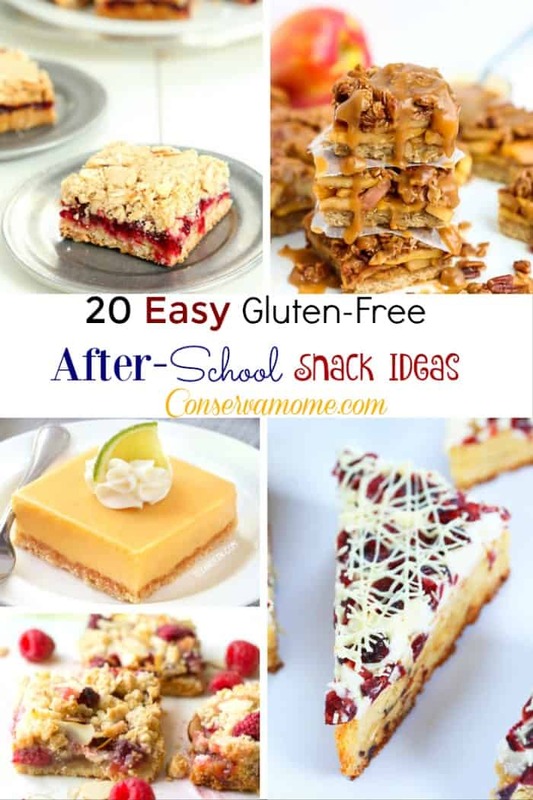 Taking gluten out of your diet (or your kid’s diet can be rough,complicated and stressful) However, with this great list of Gluten Free After school snacks it doesn’t have to be. Most can be made ahead and refrigerated for when you need them. Others taste warm best fresh out of the oven. Either way Going Gluten Free never tasted so good with this list of 20 Easy Gluten-Free Snack Ideas . Make sure and check them all out for yourself and most import, repin this post for later so that you can come back to it when you need this great list of snacks to help you all survive the back to school chaos. Don’t forget to check out all my other recipes and round ups on Pinterest. There’s something for everyone there! Enjoy and indulge in these delicious recipes and treats! So many yummy snacks. I got to find the one I can make. Thanks for the information and ideas. I have a lot of extended family members who are now gluten free. It’s great to have some good recipes for when they come over! So many yummy ideas! Thanks for including my PB bars! Yum! I’m looking forward to trying these recipes! Thank you! I can’t wait to try this banana bread recipe! Thanks for sharing. I’m a special education teacher with multiple gluten free students. I’d love to try some of these recipes out with them! The Healthier No Bake Peanut Butter Cookie Bars sound amazing! Going to try them soon! Yum, we will definitely be trying those strawberry jam bars! Oooo! All of these sound so good! Thanks for the compilation, these would be great for me for work too. I would love to try the peanut butter cookies and the no bake banana bread bites! We’re not really gluten free over here but these recipes still look delicious. I think I might just have to try a few especially the cranberry jam bars they look amazing.